Ask somebody not from South Korea to describe K-pop and you’re likely to hear something about technicolor visuals, choreography as coordinated as ballet, or wildly adventurous hit songs. You might also hear the name of SHINee (that’s “shiny”), a group that embodies the harmony of these qualities better than just about anyone. Grinding nonstop since 2008, this boys-to-men quintet has grown into some of pop’s best live vocalists and dancers worldwide – especially considering how they keep insisting on doing both at the same time. New album Odd, SHINee’s fourth (not counting a slew of mini-albums and Japanese full-lengths), flexes the full gamut of their well-toned quirks. Songs like "Trigger" deliver on the group’s longstanding commitment to avant-garde modern pop, while lead single “View” reprises their knack for reinterpreting a recent dance music trend in an elegantly composed, breathtakingly choreographed, refreshingly vibrant pop package. (This time, it’s house music.) They’re also stand-out stylish in a field of stiff competition, constantly experimenting with new looks after having once brought the skinny jeans craze to Korea with what local media dubbed the “SHINee trend". At the Seoul headquarters of their label, SM Entertainment, we met Jonghyun, the group’s 25-year-old songwriter and vocalist, as well as 21-year-old singer and dance god Taemin. Catching the guys in the middle of Korea’s famously hectic promotion cycle, you might understand if they had been a bit scatterbrained or short on time. But they had plenty to say, dishing on their recent sold-out two-night stay at the Tokyo Dome, their teenage decision to become popstar trainees, and what makes K-pop different. Jonghyun, you co-wrote the band’s new single “View”, which blends pop with deep house. How did it come about? Jonghyun: Well, first off, I believe K-pop encompasses many complex aspects compared to other music cultures and genres. K-pop isn’t just about the music – there’s much more to it, involving dance, concepts, videos, and fashion. On the musical side, deep house is a genre that’s been developing internationally for a long time, but I think our song “View” is the first song within K-pop to weave in that sound, and bring it to the masses. We wanted it to feel new and sophisticated. And with the video, we weren’t working on a closed set or just singing along to the lyrics like the usual. Taemin: With the choreography, we tend to use a lot of fresh urban dance trends and work with some of the hottest choreographers, like Ian Eastwood this time. Choreography and musical approach are where we like to try new things. Fashion, too. 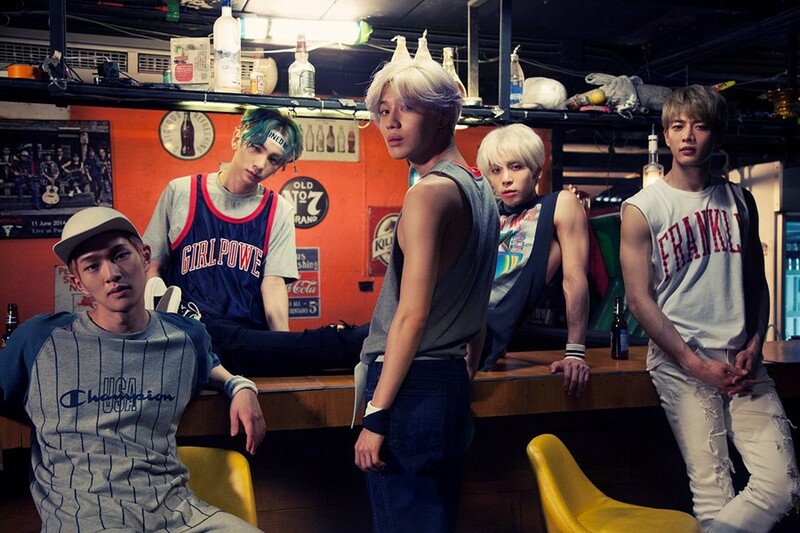 Jonghyun: Right, our fashion style (this time) is a mix of ideas, with a lot of old school, kind of vintage looks. Even with our look, we try to express ourselves in a detailed way. What are your favorite songs off the new album, Odd? Jonghyun: I’m most into “View” and “Romance”, which has so many technical eccentricities. There are constant key changes, which I find really appealing. These days there are a lot of pop songs that are loop-based, but I think this song breaks away from that kind of thing. It feels really progressive. Sometimes you guys do straightforward pop, but you also have these more experimental songs. Which do you prefer doing? Taemin: We just like what’s good. Rather than us being trapped within a genre, we’re always open to new adventures. Jonghyun: I’ve learned there are quite a few things we can do as a group that wouldn’t be possible if I were alone. So when we work together, we try more challenging things with everything. Even if we question whether we can pull it off, we always try. For Taemin and me, we’ve released solo albums and we plan to make more. So even if our own identities are a little more present in our solo projects, when we’re with SHINee, we want to blend various colours and genres. What kind of music inspired you when you were younger, Jonghyun? Jonghyun: In my teens, I got really into a lot of songs by people like The Neptunes and Darkchild. I listened to (The Neptunes) so much because of their production style, and the arrangement of their songs. After getting really fixated on their drum sounds, I came to believe that rhythm is the most important thing to a good song. I think the fact that they could use any combination of instruments to express their grooves was what attracted me. Around that time you got scouted by SM Entertainment, playing bass at one of your bands’ gigs in middle school. You weren’t even a singer then – what did you think about training to become a pop star? Jonghyun: Honestly, in junior high I didn’t dream of becoming an idol or a pop singer – I just had this vague idea that I wanted to continue my band and pursue music. The beginning was very light. I didn’t go about the audition head-on, and didn’t really think, “Oh, I really need to pass.” It was just for fun. I was lucky enough that it led to the opportunity that it did. Do you remember a specific moment that made you get more serious about it? Jonghyun: I think the moment I listened to my own recording is the moment I became much more sincere. Before that, I’d never had a chance to really hear or document my progress. (My band) would have practices, and do live shows, but to record something at SM and hear it with my own ears was just so appealing. And Taemin, you went to audition for SM when you were just 11 years old. What had made up your mind so early? Taemin: Well, at that age I didn’t really know what it meant to be an “idol”. I just liked to dance and sing. The people around me told me that the best way to go about it would be to join the largest and most powerful artist agency. At that time I had no other thoughts, I think I found an occupation that fits me really well, from a young age. You’re the youngest member of the group, and were still 14 years old when SHINee debuted. That must have been crazy. Taemin: To be honest, I wanted to debut a little later. At that time I didn’t think I was ready yet. But I debuted, and I learned so much from it. The things that I didn’t learn as a trainee I had to deal with straight up, as a kid, which I think helped me to learn quicker than others. Most importantly, the things I needed to do were presented right in front of me every day, so it gave me a lot of opportunities to really develop myself. You recently sold out two nights at the Tokyo Dome, playing for 110,000 people. What’s your next big goal? Jonghyun: I think everyone must have different dreams, but I believe that as SHINee, we have to keep striving and do things that are a bit more sophisticated and detailed. Personally, I don’t have ambitions when it comes to numbers and sizes, but I want to achieve new things with the people that we’ve worked with along the way. After the Tokyo Dome, of course we’d be thankful to do another show there, or at an even bigger venue – but I think the most important thing is that we continue to just put in work. Taemin: As for me… SHINee is going into our eight year now. We’ve achieved a certain amount (with the band), so I don’t see anything wrong with developing our individual careers within and around the group. For example, some of us act, or release solo albums, so if all of these can complement and help each other, it’ll help us all grow. Right quick, before you have to run – name one western artist, living or gone, who’d be a dream collab. Taemin: August Alsina. His music is the type I really like, I’m way into him these days. Jonghyun: Lately I’ve been really stuck on funk and older music, so it’s James Brown for me.